For the past two years, the National Football League has been rife with petulant, millionaire players mounting anti-American protests during the playing of the national anthem, turning the league from “America’s game” into a hatefest for the country. But not every team took a stance solely against the country and the Minnesota Vikings was one of those who at least reached out to our soldiers. For the 2017 season, the Vikings were one of the few teams to reach out to the armed forces and their efforts resulted in the branches of the military moving into the Vikings’ stadium to create a moving tribute our fallen soldiers. The tribute the team developed with the military recently went viral online. 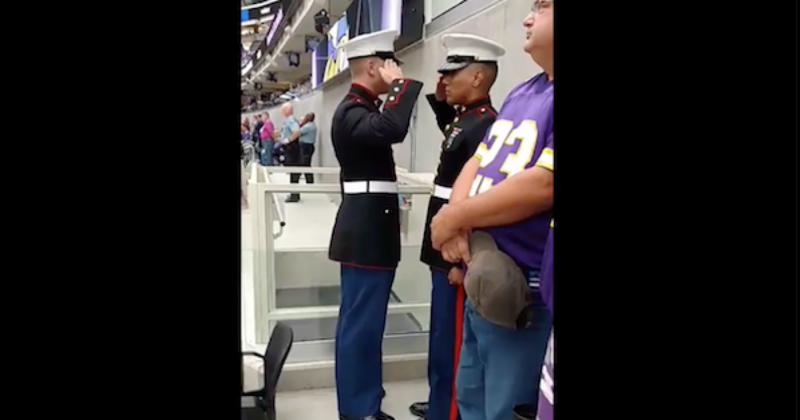 It depicts Marines standing guard during a Vikings game over an empty seat symbolizing those service members who were prisoners of war or are still missing in action. The video posted to Facebook ended up with nearly 3.5 million views and over 36,000 shares. With the exception of the inclusion of rifles, the tribute resembles the guard over the tomb of the unknown soldier at Arlington Cemetery in Virginia where members of the military mount guards to honor those who have fallen in battle and never been identified. “Decorated with the POW/MIA logo and set in front of the seals of the five branches of the United States Military, the seat honors military personnel missing and unaccounted-for from all conflicts, including the 1,618 from the Vietnam War,” the team added. “A plaque accompanying the seat states ‘With reverence we hold this seat of valor for those brave men and women, living and dead, who sacrificed in the limelight of honor and glory that we may have freedom. They will not be forgotten,’” the Vikings concluded. The tribute is manned by different members of the military for each game and with the Super Bowl headed to Minnesota, the seat will once again be guarded by our soldiers. Of course, this isn’t to say that no members of the Vikings ever joined the anti-American protests. The Vikings did join the protests early in the 2017 season, but after that Minnesota has not indulged much by way of national anthem protests. Indeed, Vikings’ quarterback, Case Keenum, has even publicly refused to participate in kneeling protests during the national anthem, Conservative Tribune reported. So, hats off to the Minnesota Vikings who helped sponsor this moving tribute to our armed forces. Even as the NFL more and more goes from being the America’s game to becoming the Anti-American game. the Vikings, at least, gave some due respect to our soldiers.